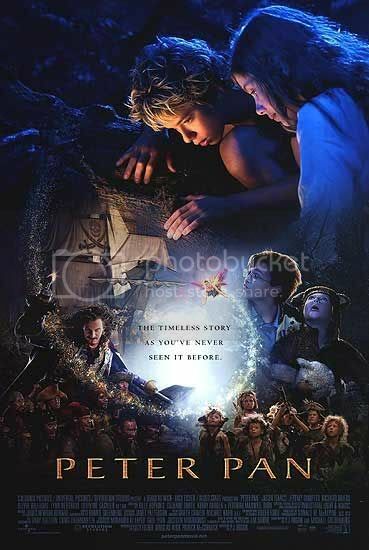 In this 2003 version of Peter Pan the story finally gets the big budget fantasy treatment it deserves. The narrative, almost as rich and fantastical as The Wizard of Oz [reviewed here], is brought to life with a vivid color palette, strong acting, and a wonderful sense of imagination. The premise will be familiar to anyone who has seen Disney’s version or the Mary Martin stage production. Wending Darling (Rachel Hurd-Wood) is a young girl growing up in London with her two brothers, parents Mr. (Jason Isaacs) and Mrs. (Olivia Williams) Darling, and her nanny, Nana, who is a dog. She tells her siblings fantastic stories about far away places, great adventures, and pirates, though her Aunt Milicent (Lynn Redgrave) wishes her to be more proper and respectable. Little does Wendy know that most nights she has an extra listener hovering at her window. Peter Pan (Jeremy Sumpter) is a little boy who has never grown up. He lives in Neverland, a place where one does not grow older. He has no father, no mother, only a gaggle of similarly lost boys that he leads. His nemesis, Captain James Hook (Jason Isaacs), is the leader of a group of pirates that are in a state of perpetual conflict with the Lost Boys. Hook’s greatest wish is for Peter Pan to be dead, and his greatest fear is that the gigantic crocodile who gained a taste for his flesh when it bit off his hand will find him. Some nights Peter flies to Earth to hear the tales told by Wendy, stories of Cinderella and Snow White. One fateful night his shadow becomes detached and remains in the Darling household after Peter has left. Wendy offers to reattach it to Peter on a subsequent visit, and a friendship is formed that involves the giving of a kiss, which to Peter and Wendy is a golden thimble. Pretty soon Wendy and her brothers find themselves streaking off to Neverland behind Peter, where a great adventure lies in wait for them. The movie, too, is a great adventure. The entire production portrays the fantasy and whimsy that the story deserves, while retaining the excitement and action afforded by a group of pirates, a tribe of Indians, murderous mermaids, and a misguided Tinkerbell. The special effects are at once cartoonish and gorgeous, creating a rather unique aesthetic. The acting is superb, serving to lend a great deal of credibility to some of the complex themes. Hurd-Wood, in particular, stands out as the movie demands she bear the brunt of the emotional load. Jason Isaacs seems a bit of an odd choice as Mr. Darling, considering that he normally plays a villain (Harry Potter and the Goblet of Fire [review here], The Patriot). It is a return to normality when he turns up again as Captain Hook. What struck me during the film is how deep some of the themes venture. Peter is a boy, enjoying the adventures and thrills of living outdoors, on his own. He fears growing old, becoming staid and uninteresting. Hook is the spitting image of jealousy and dissapointment; he wishes he could be young while simultaneously despising how he has turned out as an old man. Wendy is an even more complex character. She understands the lure of unlimited adventure with none of the tiresome stresses of being old. At the same time she knows there is more to experience when you grow up. She wants to feel the greater joys and more painful sorrows one can only know when they are older. There’s a little bit of Peter and Wendy in all of us, I believe. I sometimes yearn for the days I spent romping through the hillsides in Pakistan with a gang of friends, fashioning weapons out of sticks and stones. I now understand there is much more of life to be experienced, and the only way to do that is by growing old. Life is truly a great adventure. For those who have never seen any version of Peter Pan, this is a great place to start. Those turned off by the Disney version may find a more faithful adaptation of the story in this film. Regardless, it is a very good movie and well worth the effort to watch it for the first time or the fourth time. This entry was posted in 3.5 pirate flags, 3.5 stars, Movie Reviews, P on December 20, 2009 by Tim Irwin.